Lamar Central team photograph at the topping out celebration above. 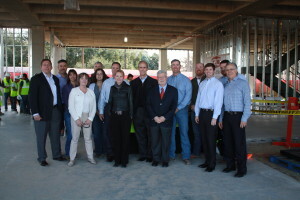 Pictured from left to right, Jeremy Hahn, Highland Resource, Alan Codina, Rogers-O’Brien, Miranda Minchew, Rogers-O’Brien, Gloria Catalani, Highland Resources, Susan Stewart, Rogers-O’Brien, Paul Muenchinger, Rogers-O’Brien, Jeff Simmons, Highland Resources, Jessie Ray, Highland Resources, Charles Wolcott, Highland Resources, David Bodenman, Highland Resources, Trey Stewart, Rogers-O’Brien, Drew Kelley, Welden Johnston, Highland Resources, Jacob Walker, dwg., and Brent Jones, Rogers-O’Brien. 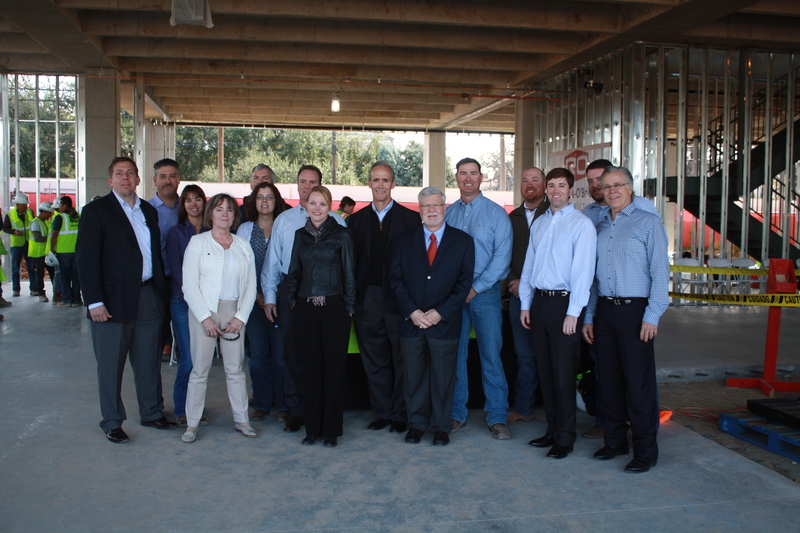 Austin, Texas – (February 19, 2015) – On the heels of landing anchor tenant Kendra Scott Design, developer Highland Resources and its general contractor Rogers-O’Brien Construction celebrated the topping out of Lamar Central, the signature Class-A, mixed-use development located on 38th St. and N. Lamar Blvd. The celebration took place on Thursday, February 19 at 11:30a.m. Project team members gathered at the jobsite to commemorate this significant milestone with a BBQ lunch, a team photograph and brief remarks from the development team and construction team members. Scheduled for completion on October 1, 2015, Lamar Central will be a four-story, 165,000- square-foot, office and retail development, featuring more than 132,000 square-feet of column-free office space with an additional 33,000 square-feet of retail and restaurant space. Project team members include: Highland Resources, Inc.; Rogers-O’Brien Construction; STG Design; Consort, Inc.; Studio dwg. ; Chioco Design; American Realty Project Management; BSA LifeStructures; CBRE, Inc.; and Oxford Commercial. A live-feed of Lamar Central may be viewed at www.lamarcentral.com. Lamar Central, located at 3800 North Lamar Blvd., is situated near downtown in a major employment center and in close proximity to a wide variety of housing options. The development provides an alternative to a downtown location, but with all of the same benefits–restaurants and retail, walkability and access to various modes of transit, parks and trails. Lamar Central offers its tenants proximity to premier residential neighborhoods with north/south access along MoPac and crosstown access along 38th and 45th streets. For more information, renderings, maps and videos about Lamar Central, please visit www.LamarCentral.com. Highland Resources, Inc. is a family-owned real estate investment and development company with a proud history and remarkable track record of success in developing residential and commercial projects. From the Driskill Hotel and Southwest Tower to the award-winning Highland Horizon mixed-use development in Round Rock, Highland Resources is rooted in this community with connections to some of the region’s most iconic structures. The company has accumulated and owns more than 25,000 acres of land, 5.6 million square-feet of industrial space and numerous office buildings and shopping centers in Texas and Arkansas. Highland is currently developing five different tracts of land in Texas and Oklahoma for commercial and residential use. Additionally, the company owns and operates Highland Deephaven, a 430- acre industrial development located near Inverness, Scotland, servicing the North Sea oil industry. For more information, please visit www.highlandresourcesinc.com.